Most stay-at-home dads will have seen enough episodes of Blue Peter to know that just about anything can be made out of half a dozen egg cartons and some double-sided sticky tape. Now is when the skills gleaned from watching Peter Duncan and Janet Ellis turn a couple of empty washing-up liquid bottles and a handful of pipe cleaners into a scale model of Concorde come into their own. Even in this digital age, when children can enter a virtual world and save planet Earth from imminent destruction armed with only a blue hedgehog called Sonic, there is a place for arts and crafts. In fact, when faced with so many hi-tech distractions, it is perhaps even more important that children get the opportunity to express themselves through art. The artistic flair locked inside every toddler can be released as soon as they understand that a crayon is not a foodstuff. Even something as simple as a packet of crayons and a few scraps of paper can start a child on a journey of creativity, imagination, entertainment, learning and accomplishment. 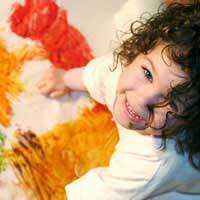 Toddlers love to scribble with coloured crayons or sculpt with play dough and will progress quickly to other art mediums, such as glue and glitter, chalk, paint and papier-mache. Play dough can be squished to blend different colours, modelled or pressed out into shapes using plastic tools, and its versatility makes it popular with young children. As a general rule, the messier the better. Of course, this means the play dough gets mashed into hair, shoes and clothes, while face painting will be accompanied by floor, wall and furniture painting. In fact, anything within reach will get a lick of paint, but that is part of the fun for toddlers. Clear and cover a table or an area of floor and make sure all valuables are out of splash range before getting started, or if the thought of such a mess is too much to bear indoors, go outside. Remember that this is an important part of a child's development, as it teaches them about form and substance, improves motor skills and enhances imaginations, so dads can't let a bit of mess put them off. Never force a child to sit and paint or scribble with crayons, as that will take all the fun out of it, but do persevere. Rather than be discouraged by a child's lack of interest, try to explore different options at different times. The alternatives are almost endless, limited only by imagination, and the range of crafts available for children is so diverse that there is something for everyone, whether 12 months or 12 years old. It is important not to be disparaging about a child's artwork. Dads should always be positive and encourage the child to let their imagination run free. Join in too, and give the children memories to store away. They will never forget that masterpiece created with dad, whether it was a papier-mache landscape for a train set or art deco furniture for a doll's house, made using half a dozen egg cartons and some double-sided sticky tape.